The Qualcomm Snapdragon 820 MSM8996 is a high-end ARM-based SoC largely found on Android tablets and smartphones. Announced in December 2015, the S820 is the successor to the Snapdragon 810 and should start shipping in the first half of 2016. In addition to 4 CPU cores (two slower clocked and two faster clocked Kryo cores), the SoC integrates an Adreno 530 GPU with a LPDDR4 memory controller and supports Wi-Fi (802.11ad + MIMO), Bluetooth 4.1, and LTE. 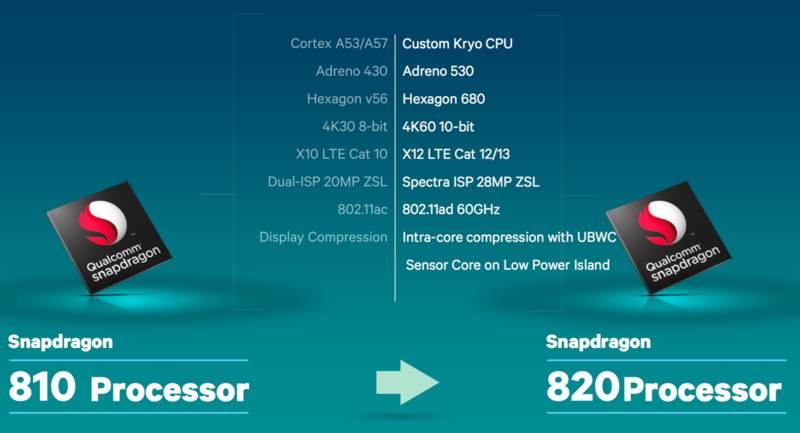 The Snapdragon 820 is based on a similar concept as ARM's big.LITTLE, which combines a low power CPU cluster (2x Kyro clocked at up to 1.6 GHz) and a performance CPU cluster (2x Kyro clocked at up to 2.15 GHz). The clock speed of each cluster can be individually adjusted (but not per core) and the lowest clock speed is 310 MHz. The performance cluster features 1.5 MB L2 cache and the power saving one 512 KB. Both should be using the same architecture and fully support the ARMv8-ISA instruction set. Although only four cores are used, the performance of the 820 is located in the high end of mobile CPUs for smartphones and tablets. The Adreno 530 outperforms the previous Adreno 430 especially in high demanding benchmarks. Therefore it is well suited of modern 3D games on Android devices and should rank slightly below the Tegra X1 GPU. The Snapdragon 820 offers numerous wireless technologies such as Bluetooth 4.1, WLAN 802.11a/b/g/n/ac/ad (60 GHz) + MIMO as well as a dual-SIM cellular modem supporting LTE cat. 12/13 . The SoC can encode and decode 4K videos using dedicated hardware (H.264 and H.265). Thanks to the new 14 nm process, the energy efficiency has been improved noticeably compared to its 20 nm predecessors.